With the much anticipated US launch of Spotify and the successful IPO of Pandora there’s a very palpable sense of momentum in streaming music. And that’s great news, the future of music revenues will depend upon a successful transition from distribution based models (downloads, CDs etc) to consumption-era models (on-demand streaming etc.). Yet, there’s a growing sense that the current Freemium business model just isn’t fit for purpose. I’ve written before about the challenges of squaring the consumption circle (see my post here for more). There is a direct tension arising from record labels feeling they don’t get enough from ad-supported music, and from the services themselves feeling that they actually pay too. To complicate matters even further, it is becoming increasingly apparent that artists aren’t getting enough out of ad-supported music either. 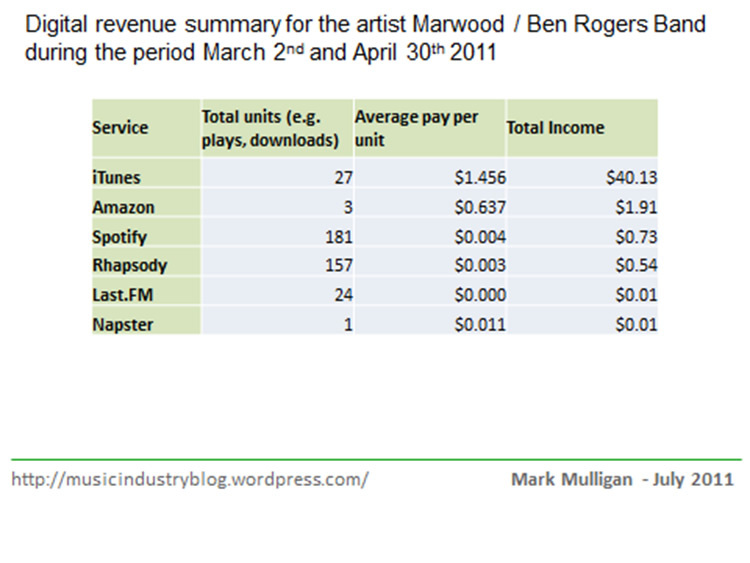 Singer / songwriter Benji Rogers of Marwood (and who also happens to be the founder of the great direct-to-fan funding music site Pledge Music) generously offered to share his digital revenue data to illustrate how his income spreads between different music services. Looking at Benji’s digital music revenue for March and April (see figure 1) the glaring disparity between download stores and streaming services is immediately apparent. In terms of units of activity (i.e. a stream or a paid download) streaming services are way out in front, with 92% of total units for the period, yet in revenue terms the relationship is reversed, with them accounting for just 3% of total income. (You can read more about Benji’s digital music income here). Now of course streaming based services are always going to generate a significantly lower unit of income than a download, but the inverse income-to-unit relationship here is misaligned to the extreme. What Happens If / When Downloads Go Away? The other side of this equation is the vastly important role that downloads play in artists’ recorded music income. The download revenue is effectively bringing the income dynamics of the old CD model into the digital equation. But there is also massive risk with the download dependency. Download sales growth is slowing and there is little evidence that the 99 cents download model translates well outside of the iTunes ecosystem. 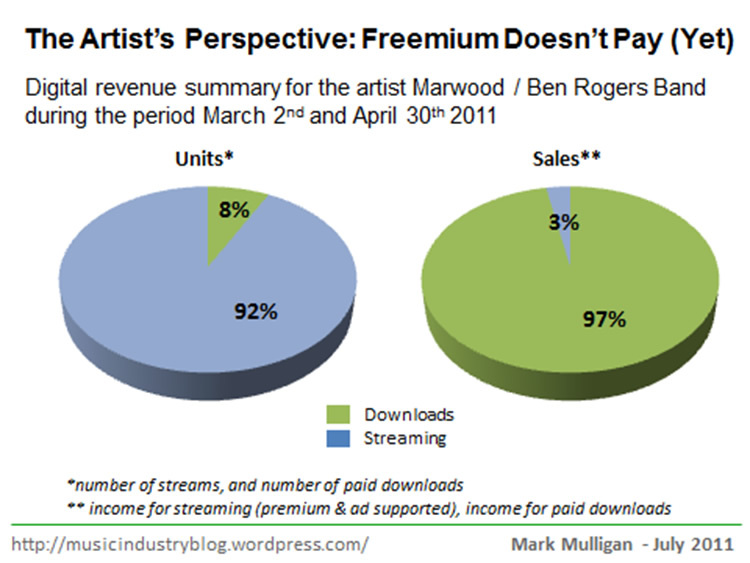 Worse still, the current momentum in digital music business models and behaviour is in streaming not downloads. Take a look around: Amazon, Google and of course Apple have all jumped on the locker bandwagon. And as Benji’s data illustrates painfully well, streaming is where consumers are going too. While downloads may not disappear entirely, their role is set to lessen markedly in the midterm future and most of the alternatives in play from the big three players generate much lower income for artists. And to be clear, this isn’t just a problem with Freemium. Streaming services as a whole just aren’t delivering enough income for artists. Spotify is much maligned for the raw deal it is perceived to give artists, yet when you look at the average-pay-per stream Spotify actually pays out more than that darling of premium services Rhapsody (see figure 2) despite the majority of Spotify’s streams being ad supported rather than premium (something feels broken there). The simple fact is that the disparity between paid downloads and streaming is unsustainable. It just isn’t tenable that 3 paid downloads from Amazon can still deliver 50% more revenue than all the streaming services combined over the same period and yet have less than 1% the activity level of those services. Is Freemium No Longer Fit for Purpose? No one in the Freemium value chain thinks that they’re getting enough income: not labels, not publishers, not artists, not the services themselves. It looks increasingly like the Freemium model itself is fundamentally flawed, that any fix will do little more than paper over the cracks. And the new wave of locker services are only marginally better. They share the same fundamental revenue share dynamics when compared to download income (for all parties). So what is the answer? As I said in my June Midem post (click here to read more), first and foremost business models and products must be innovated. There simply aren’t enough levers left to pull in the ad supported streaming business models to fix the problem. That doesn’t mean that services such as Spotify, Pandora and We7 don’t have a future, they absolutely do, but their future lies in successfully bringing in business partners to subsidize premium tiers of their businesses to make music feel-like-free or close-to-free for mainstream customers (see my previous post on Digital Music’s Third Way for more on this). Spotify’s US launch will bring a great new music experience to US music fans, but Spotify will need partnerships like it has struck with Virgin Media, 3 and Telia Sonera in Europe if it is going to be sustainable. But most importantly we need a new generation of music products that leverage social, user participation, access models, multimedia and device connectivity to the full. Ad supported streaming can evolve, it doesn’t need to be the Neanderthal of digital music’s evolutionary chain, but unless evolution happens quickly there is a very real risk that many artists will start seeing their recorded music careers face extinction. This entry was posted in Ad Supported, Music, Paid Content, Subsidized Music and tagged Ad Supported, Artist Income, Digital Downloads, Digital Music, iTunes, Mark Mulligan Forrester, Music, Music Industry, Napster, Pandora, Pledge Music, Rhapsody, Spotify, We7 by Mark Mulligan. Bookmark the permalink. Mr Card! Absolutely, but most artists do not have their own labels, even those who use DIY services have to pay out to a middle man. You’ve hit the nail on the head though, ad supported analog streaming (i.e. radio) was all about trying to sell music product, now digital streaming is becoming the product, so the income dynamics have to change and a new product that streaming can sell has to come to market. Independent or RIAA, attempting to make streaming (or even downloads) ‘the product’ has always been a flawed model. Sure, icing on the cake might result from a viral video or audio stream, but to rely on it as the primary revenue is foolish. My advice to an indie artist is to put it out on the web for free, no DRM or restrictions to the potential fan and try to sell vinyl. My advise to the major labels is to give up and die off like the dinosaurs they are. The world has changed. The internet meteor has struck! I think the answer here is more obvious than it seems, but then again I’m biased. You have internet radio on one hand, which is a great discovery tool and lets people search for new music in an easily digestible format, and these companies mostly try to monetize it with unrelated ads for cars and fast food. Users have no reason to look at the screen because the most important content is audio, so the ads perform poorly, sell at low rates, and while it’s a piss-poor amount of revenue for 99% of labels and artists, none of the companies can cover the high costs of these royalties when they add up. Meanwhile, you have every record label and artist taking their terrible royalty check and recycling it into radio promo, publicists, text and visual ads, and all kinds of other ineffective marketing vehicles that come with no guarantee, or are guaranteed to cost a lot and convert very poorly because text and other traditional/online advertising doesn’t convey the quality of music. Basically, you have unrelated brands trying to market their products next to music, and musicians trying to market their products next to God knows what. It seems so crystal clear to me that the best way to make radio perform better for the music industry is to stop using it to promote Toyota, and start using it to promote music. It’s a better experience for listeners, who will start paying more attention to what’s on the screen, and it’s putting money back into the music economy. The ads will perform better when they’re more targeted, resulting in a higher ROI and higher ad revenue. Hopefully, the record labels will agree that the ROI from their music being on the platform isn’t just about royalties, but about increased tickets sales, merchandise sales, fan acquisition and more. And even though they don’t always make direct revenue from those, they’ll recognize that there ought to be some concessions for companies driving this kind of value to their artists over companies that drive all of the value to McDonald’s. Fear of piracy helped provoke the stampede … and I believe this was heightened by the number of high profile tech bloggers and ‘media futurists’ propagating the idea of streaming as the ‘future of music’. For independent artists in particular, selling downloads is a perfect business model. It eliminates the need for manufacturing, slashes distribution costs, and facilitates marketing like never before. Also, it’s great for music lovers, as it’s considerably cheaper than buying physical product (or certainly should be …) and it’s more convenient. Plus, many music fans actually want to support the artists, and can now do this by buying directly from them. The so-called downsides of the digital download sales model seem to be the preoccupation of the major labels alone, but they’re dragging us all into this dubious ‘future of music’ whether we like it or not.